NYC Flooring Group, Inc. warrants all carpet labor for a period of one year from the completion of installation. This warranty applies to installation of new carpet purchased from NYC Flooring Group and installed by NYC Flooring Group's own installation experts over pad purchased at NYC Flooring Group, or direct glued to the customer's floors. Types of services performed at no charge under the terms of this warranty include the remaking of seams which gap, ravel, or fray; re-stretching of carpet which wrinkles; and replacement or repair of transition materials (metals, vinyl strips, etc.) which may become loose. Please note that in most installations seams are necessary. Our experts have been trained to minimize these seams; however seams are inevitable and are not invisible. The removal of furniture and appliances are the responsibility of the customer or can be provided for a charge. This warranty does not apply to repairs necessitated by abuse, flooding, improper cleaning, or by customers' own repairs or removal of carpet to install stereo wires, cables, phone wires, etc. Consequential or incidental damages resulting from installation services are not covered by this warranty. 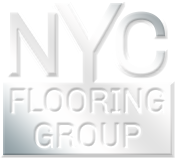 At NYC Flooring Group we use certified carpet installers providing all our carpet installations, our carpet installers are certified for leveling out sub floors, installing wall base. Our carpet installers are also certified for installing cove base, carpet cove base, VCT tile, linoleum. We have completed many carpet installation jobs in the NY METRO area, all our carpet installation jobs are backed by certified carpet installers in addition to providing full insurance for carpet installation jobs, and we are also licensed for carpet installation jobs. If you are looking to get carpet in New York, be sure to give us a call so you can get our 110% price match guarantee. Our price match guarantee ensures that no matter where you shop, where you search for carpet prices, whether you are looking to obtain carpet installation prices, you won't find prices lower than NYC Flooring Group's.